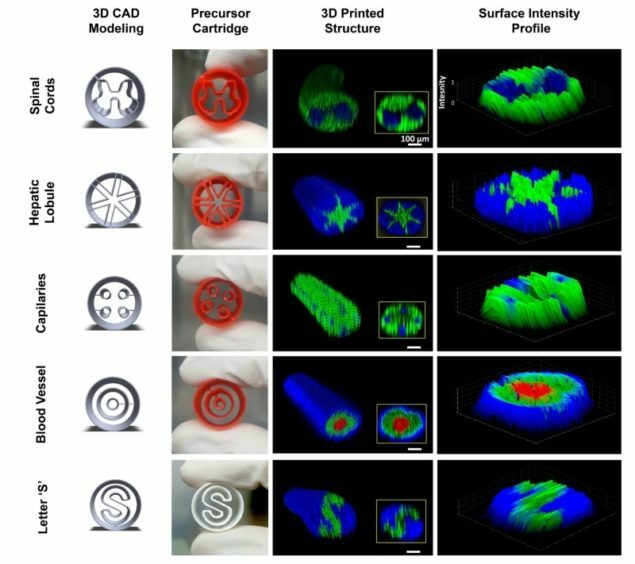 A research team headed up at Korea Polytechnic University has developed a 3D bioprinting technique that enables the biofabrication of complex, multi-material and multi-cellular tissues with a single extrusion print head. The technique uses a special cartridge with multiple compartments that keep the bioink – a 3D culture biomaterial mixed with cells – within a pre-defined formation that is maintained upon printing. The cartridge and bioprinting procedure also allows the extrusion of bioink to create a 3D tissue for use in medical research or regenerative medicine (Biofabrication 10 035008). The ability to pre-load different materials and cells into the printing cartridge simplifies the bioprinting process from an engineering standpoint, with only one print head and cartridge being needed to form a complex 3D tissue. The alternative, which is used for most extrusion-based bioprinting techniques, is to have multiple print heads filled with different bioinks and cells that are used in conjunction to print the different components of an engineered tissue. The researchers used a commercial 3D printer to manufacture the special cartridges, which enables the technique to be adapted in line with the user’s needs. The flexible design allows the technique to be applied within different bioprinter systems, as the cartridges can be 3D printed with precise dimensions to fit within a pre-existing a syringe head. This versatility also enables the printing cartridges to be designed for a specific tissue type, which the research group has exemplified by creating cartridges for biofabrication of spinal cords, hepatic lobules, capillaries, blood vessels, and even the letter “S”.